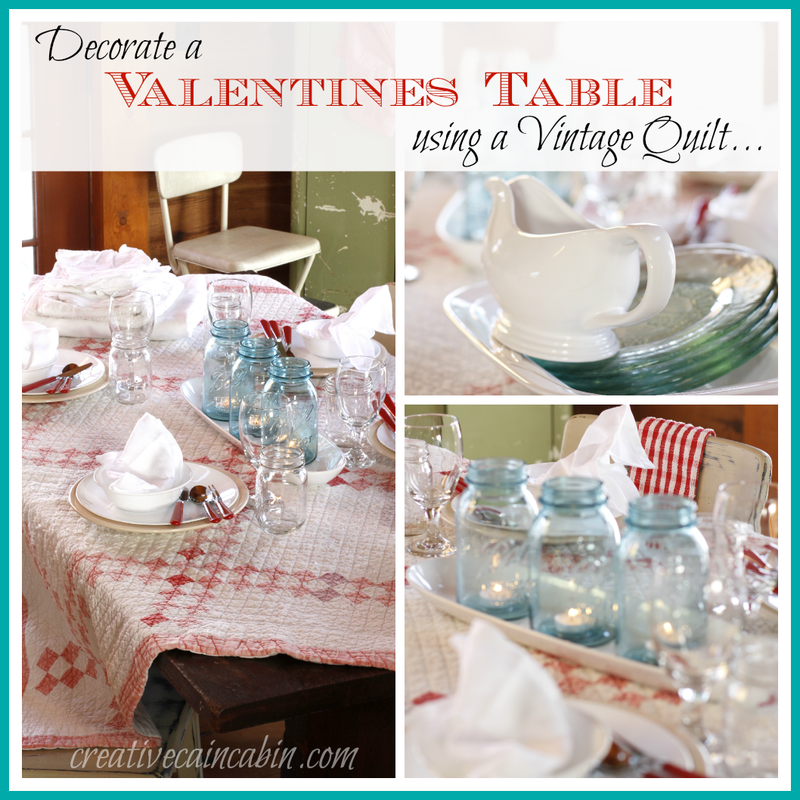 Today I’s setting up a quick and easy table for Valentine’s Day! I didn’t want to purchase anything new, plus I like the things I already own. So what I came up with was a simple farmhouse style table, with vintage quilt and all. 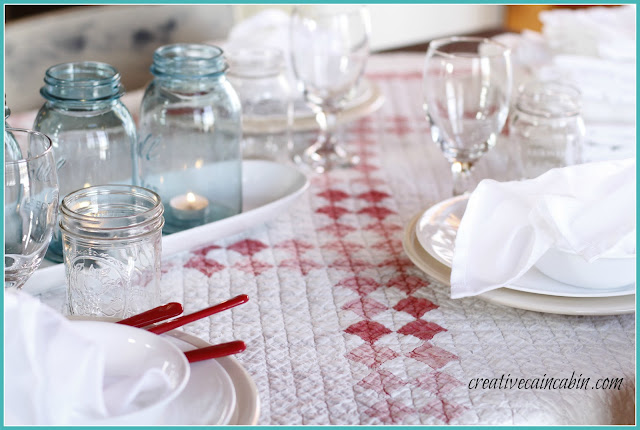 My Valentine’s table consists of a vintage red and white quilt and a combination of mason jars, red flatware, and white dinner plates. 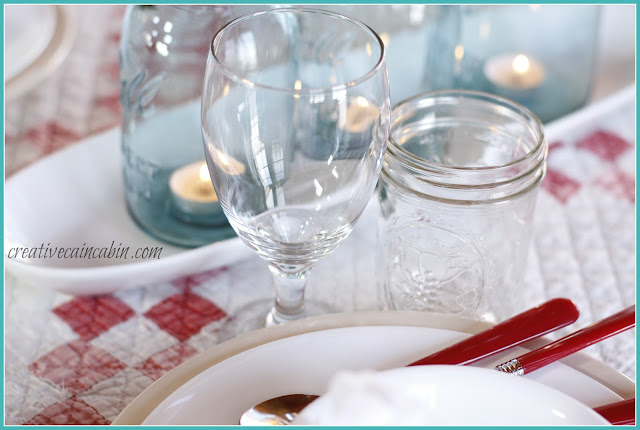 Everyone has these simple items in their kitchen and Valentines day doesn’t have to be fancy. I know you have all heard me say over and over again that I decorate with what I already have, and it’s true. I just cant comprehend buy new all the time and then having to find a place to store all that stuff. For me storing all those things seems like a waste of space, I would rather use the same items over again to make my table Valentine’s ready. The red and white vintage quilt was picked up last summer while traveling the US12 garage sales. It was raining hard and the lady just wanted to get rid of things. I got such a great bargain I couldn’t pass it up. And for a little pop of color the blue jars do the trick. As a charger I am using my Target off white dinner plates and the white bowl and dinner plate are Corelle, yes I said Corelle. Hope it’s not to tacky, but I like the look. 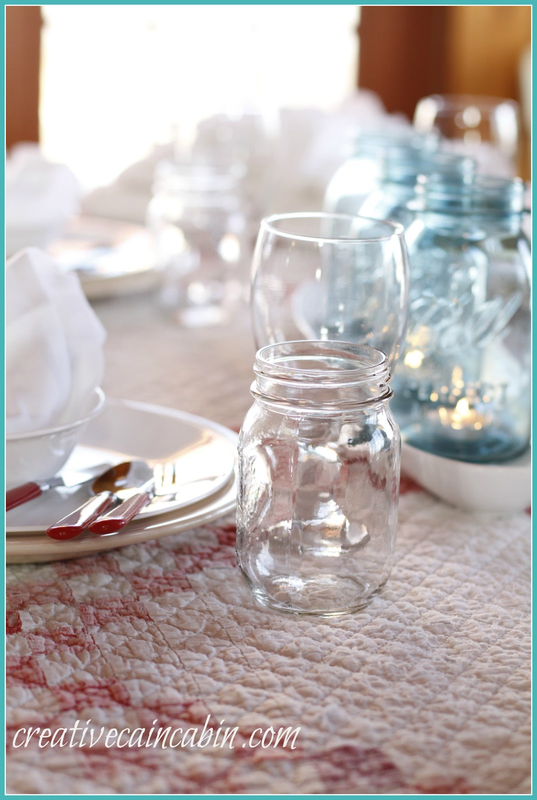 The salad plates are recycled glass and have a blue tint to them, just like the mason jars. 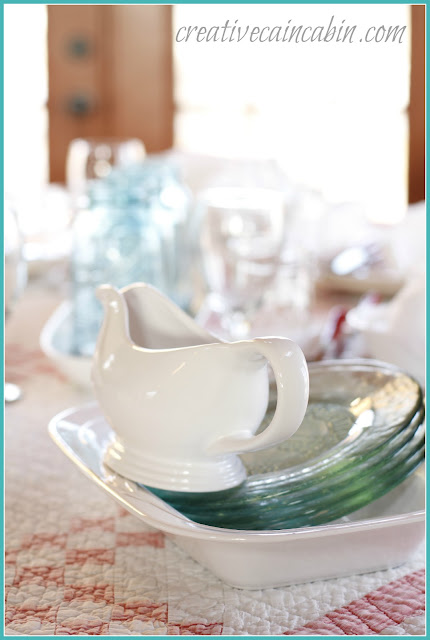 And to keep it all together I put it in a white serving dish along with the gravy boat. The blue mason jars are resting in my bread server and I dropped tea lights into them for a little glow. You can see the tea lights better here. I am ready for a farmhouse Valentine’s dinner now. To bad I will also be doing the cooking. Oh my gosh I love this. I love your use of red and that vintage quilt oh my!!!!! This is the prettiest valentine table scape I have seen. It is perfect decor for your cabin. 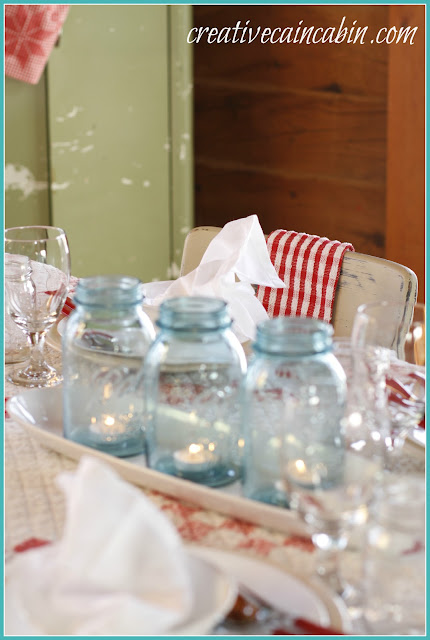 I love the pop of blue with the mason jars. This is really gorgeous Dawn. Love it. Hi Dawn! 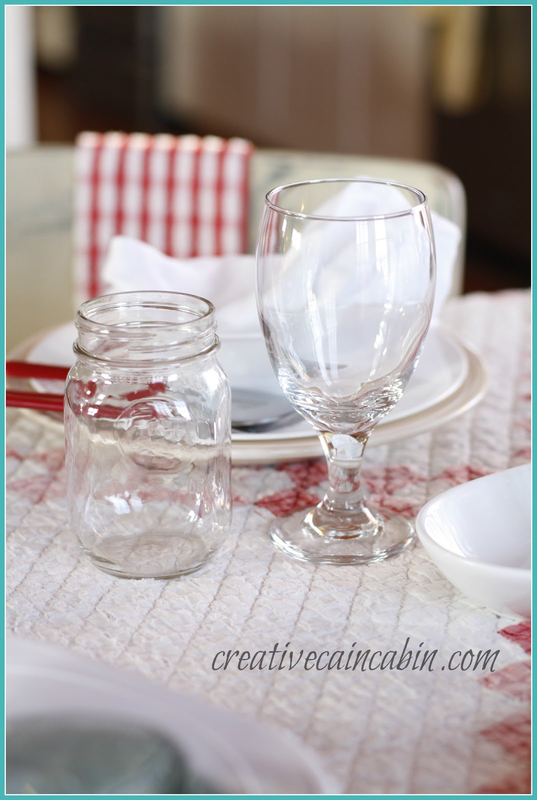 Oh, I jut love your Valentine tablescape! How smart to use the same items over again. The quilt really sets the scene and I love your photography! Gorgeous! Oh, the little houses are made from cardstock! I had so much fun making them. They’re really tiny. Dawn, it’s so pretty. 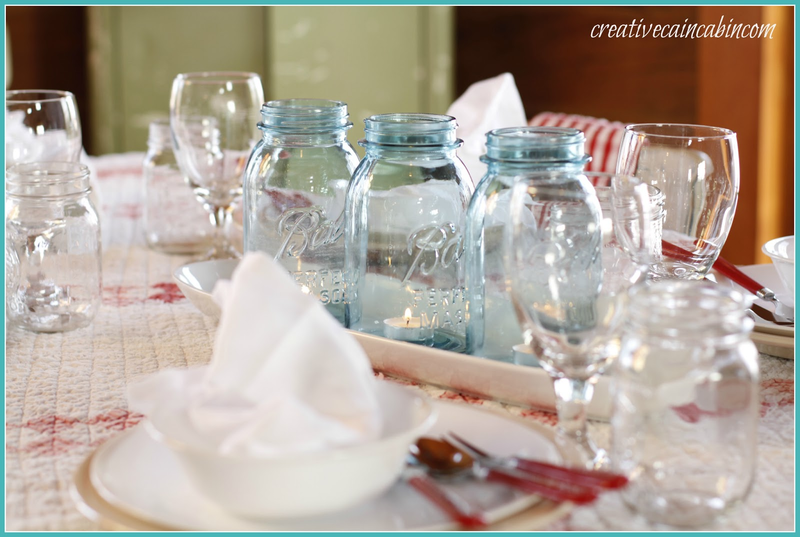 I love the touch of blue with the mason jars. The quilt is just lovely … always great to find a bargain! All of my favorite things, in one vignette! The quilt is just wonderful, you seem to really score the lucky finds. I don’t think the corelle is tacky at all, have you seen the set with the red stripes? (I think Pat at BPM showed some at Christmas) Love it all! Your table would fit right in at my house. I love that red and white quilt. It is raining here today (not common in southern California) and my plan is to go up to the attic to find fabric for a patchwork quilt. Maybe I will make a tablecloth instead. Ha! The least your boys could do would be to bring home some take out food. :o) I love this…every single thing. It’s perfect! Beautiful Dawn, Love the mason jars and the quilt is such a nice touch! Love the quilt Dawn! 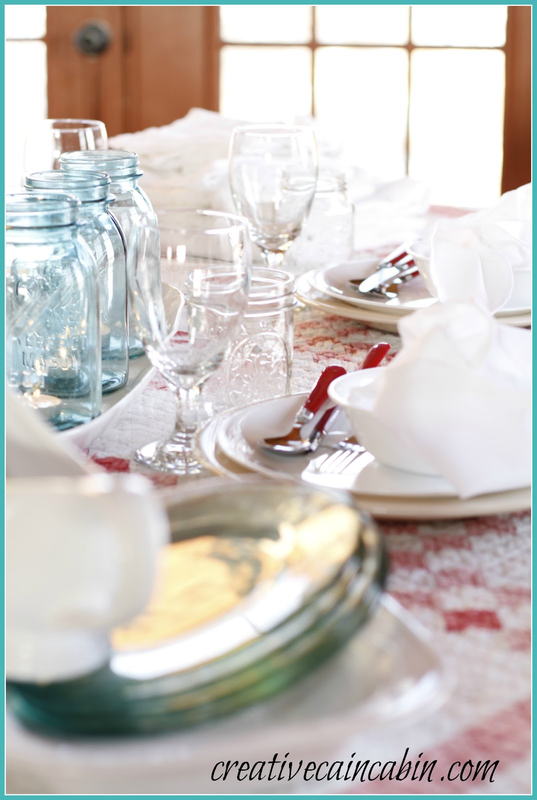 I vote for take out too:) Just a gorgeous tablescape! Beautifully done Dawn! I love your red and white quilt! Dawn, this is so pretty. I love everything about it. Your images are gorgeous! 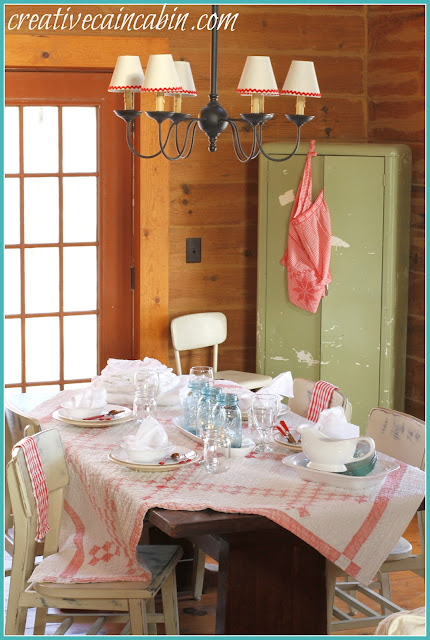 Cute table and love the quilt. What time should I arrive? This is a perfect casual (my favorite) look for your log home. I’ll try and take inspiration to get one done right after I finish the vacation laundry. Your table turned out to be so pretty. I love your quilt….I’ve been secretly wanting a red and white quilt. I saw one last summer and it hasn’t left my head yet. So pretty, Dawn! 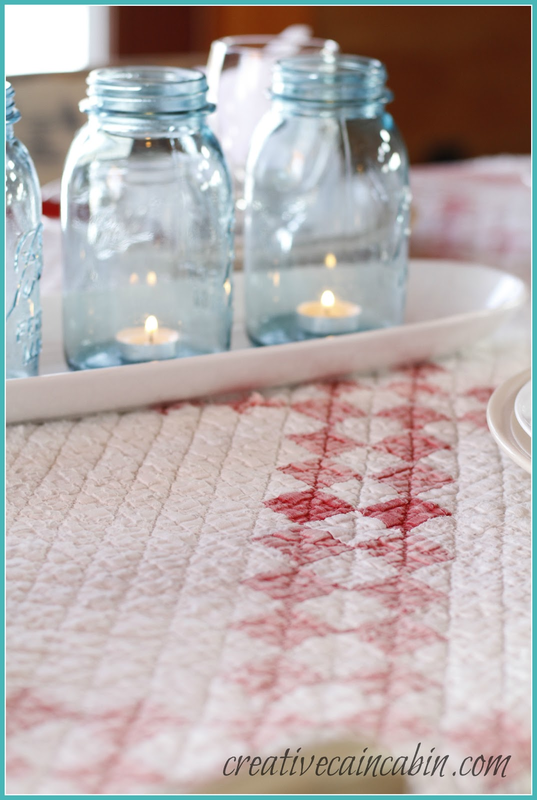 The quilt is the perfect base for your red, white and aqua theme. I’m with Marsha, I have always wanted a red and white or blue and white quilt. One of each would be wonderful. 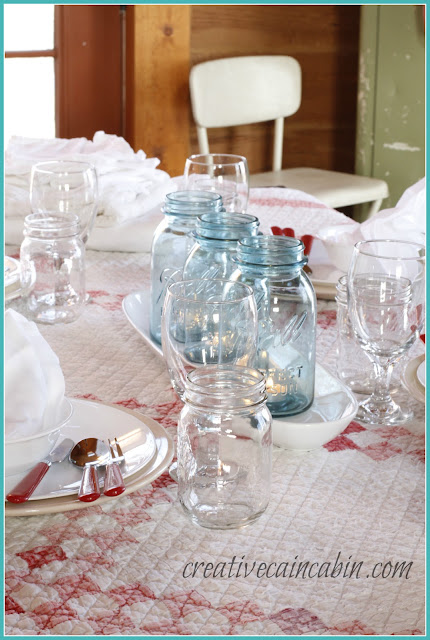 The aqua jars are so pretty and I’m a fan of white china. I use and love my plain white Corelle too. Your gorgeous quilt made me smile. I love the red and white quilts better than any other. You’ve created a beautiful tableau. And your photography: exceptional. I love, love, love the baby blues with the Valentine colored quilt. Such a beautiful arrangement! I love that quilt and the way you’re using it! And to know that you got a great buy on it, it’s even better. Your table looks so nice! Your tablescape is beautiful and love how you used your quilt. So pretty. Hope you have a great Valentine’s Day! Love the table. Every detail just makes me want to pull up a chair and stay for a meal. Love it, Dawn! 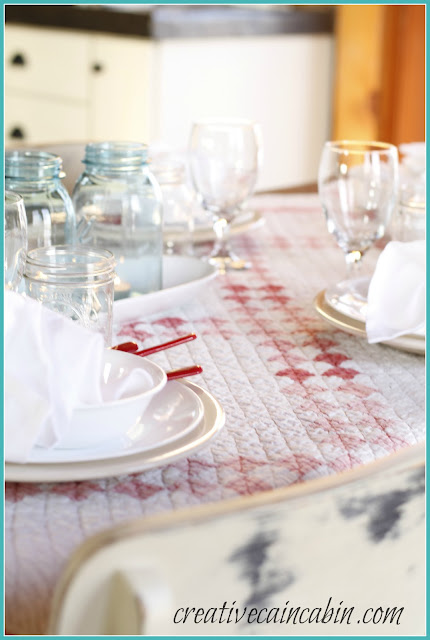 That quilt is so lovely and makes a beautiful table cover. I think your copycat is much prettier than your inspiration! Love the quilt on your table…so pretty!! Love how you have set the table too!! I agree with others that your copycat is so much prettier than the what your inspiration was. I love this look so much! O keep a file of favorite rooms, and one picture I have in my file is a pretty country library, and in the center of the room there is a small circular dining table, and it’s covered in bright quilt with mostly yellows. So pretty! I love the red and white on the table. It’s my favorite color combination! Your table looks wonderful, I love the simple red and white together with the blue mason jars. Simply lovely! 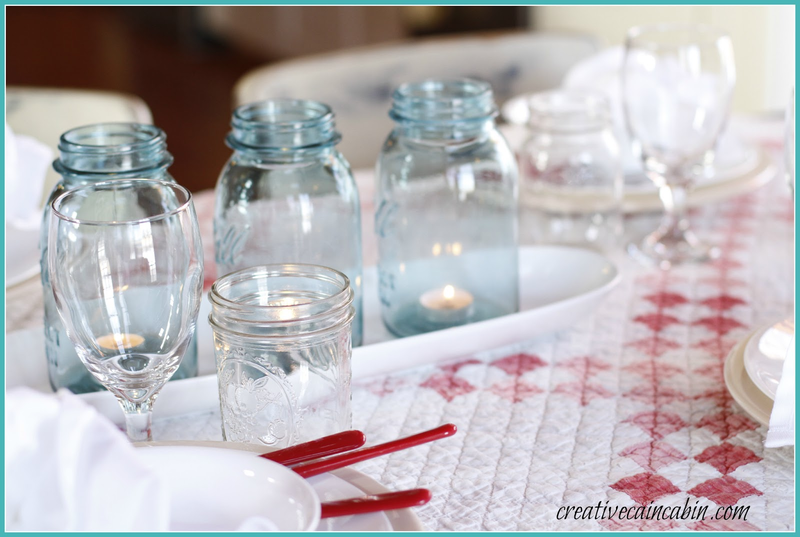 What day of the week do you have your frugal decorating party? i wish to join but miss it every week. I think with 3 guys in the house, Valentines Day is a great time for them to cook for you! 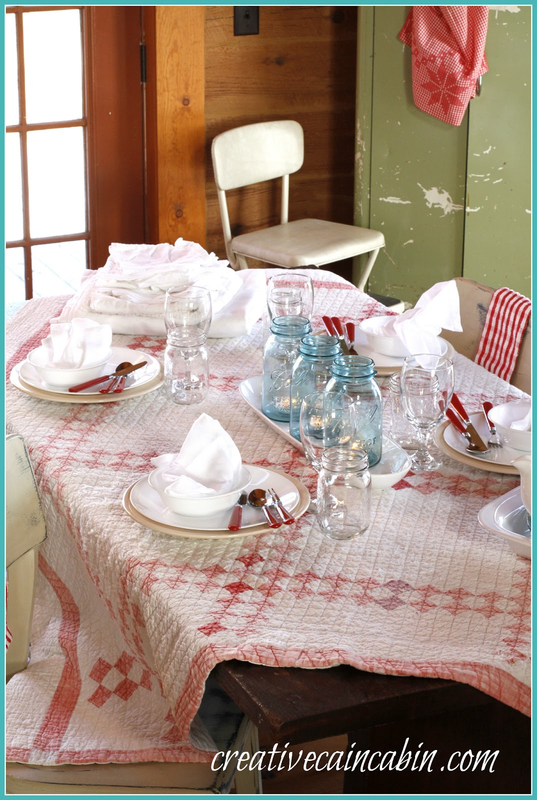 Your table definitely is a reflection of your farm home living style. I love that you use what you have, but always come up with a new way of displaying your household ‘stuff’. Very pretty, I love the use of the quilt on your table. I don’t think Corelle says ‘tacky’, whatever works is what I say. And I wanted to tell you that your glassware sparkle sqeeky clean! nutn’ tacky here friend…love the white dishes and red flatware…PERFECT! Looks and feels like a farmhouse home! So glad to see quilts being used again. Guess it’s time to get mine out? Just a lovely, lovely setting. Nice Dawn. My kind of setting for sure! LOVE LOVE LOVE that quilt!! I think I would have fainted if I had found such a great quilt at an awesome yard sale price! And your table setting is adorable.